1. Earn a 40% Fundraising Profit! Choose One or Both – Click to Learn More! Any Group Raising Money for a Cause! Last year over 19,000 groups chose Rada Cutlery Fundraising! Begin a Catalog Fundraiser and start earning profit! We take pride in taking care of you. Our customer service is staffed with experienced professionals who enjoy helping and are always ready to answer your questions. Sign up online & fill out the form. You’ll be provided a personalized affiliate link to share on social media and/or by email. Earn 40% PROFIT of purchases resulting from your link! Profits sent by eCheck every month. Begin an Internet Fundraising and start earning profit checks! DO YOU WANT A FREE FUNDRAISING GUIDE? 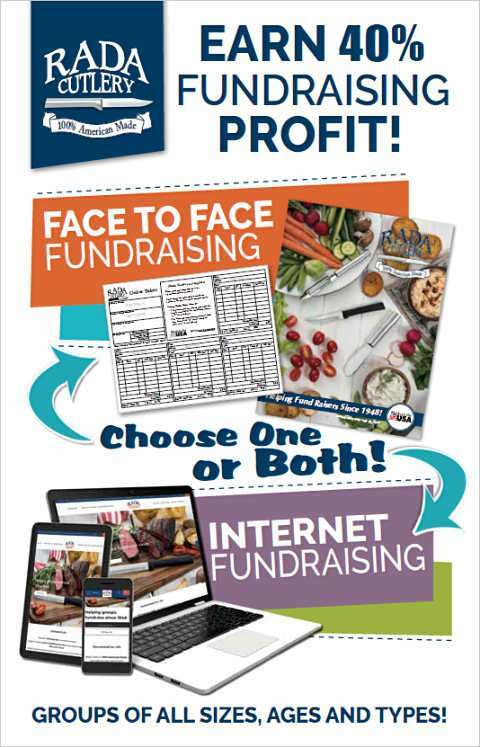 Pick a fundraiser that will WORK FOR YOUR GROUP! Offer USEFUL PRODUCTS – at factory direct prices! Staffed with experienced professionals who enjoy helping and answering your questions. Reach Us At: 1-800-311-9691! Find step by step directions, examples, and information to answer all of your fundraising questions! Continue to the Help Center to Learn More! Our Customer Service is staffed with experienced professionals who enjoy helping! Reach Us At: 1-800-311-9691!